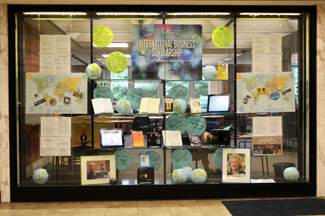 “International Business Scholarship,” a colorful, informative exhibit featuring Villanova School of Business (VSB) faculty and student research, will be on display until early August. Joanne Quinn, graphic designer and team leader for Communication and Service Promotion, worked with the VSB liaison team (Linda Hauck, coordinator; Dennis Lambert and Merrill Stein) to implement their concepts. According to the liaison team, “This window is a good opportunity to make people aware of the global VSB efforts. It shows the breadth of student [research] topics and demonstrates that faculty is heavily involved in research across disciplines. 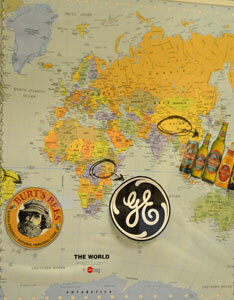 So many students’ projects have global components that we are working hard to build a collection that spans the globe.” Numerous inflated globes, miniature international flags and two world maps featuring images of product names with arrows indicating their countries of origin reinforce the exhibit’s international/global emphasis. Quotations by three VSB faculty members—Peggy Chaudry, PhD; James Glasgow, MBA; and Christopher Kilby, PhD—placed across the top of the window act as counterpoints to their photographs at the bottom. Colorful round panels placed throughout the center of the window highlight various student research topics. Faculty research is featured in posters framing the left and right sides of the window and in numerous books throughout the center of the window. A small photographic poster of the liaison team shows each liaison team member’s email address below his or her image. And two PowerPoint slide shows, created by Linda Hauck, offer screen shots of international business articles and industry databases.